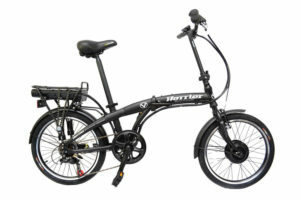 Another product from Viking is the Viking Harrier Folding Electric Bike (Learn More Here!) that can take you far and wide whilst fully powered. Viking has been around the block a few times when it comes to providing good quality electric bikes, so you can be sure you are going to get a good quality experience when using them. The Viking Harrier is perfect for those who want to ride to new places regularly, but don’t necessarily have the room at home to keep a normal bike. This Viking Harrier takes that problem away thanks to its folding capabilities, so you can be sure that no matter how small your apartment is, this bike can be stored away like it’s never there. Travel far and wide – With the 24v brushless front motor this electric bike provides, you instantly have the ability to travel up to 45km whilst assisted. This is one of the longest ranges an electric bike can cater for so you can be sure you can travel far and wide wherever you want to go. Multiple gears – This electric bike can travel far and wide which is why Viking designed it with six gears to choose from. This will help you go up steep hills when you are assisted so you don’t have to use too much energy. Multiple gears are essential for anybody looking to travel longer distances. Brushless motor technology – The 24v brushless motor is one of the most common motors in today’s electric bikes, and that is purely because they offer ultimate performance without using too much energy. Once your bike is fully charged you can expect to travel up to 30 miles thanks to the brushless motor technology. Lithium-ion battery – Lithium-ion technology is common in electric bikes these days thanks to the fact they do not have any negative effect on the environment when in use. With that, the batteries can also be charged quickly and are expected last an even longer time than other batteries on the market. Removable battery – The removable battery pack is handy for those who wish to use the bike as a standalone bike with no assist whatsoever. This is good for those looking to exercise on a daily basis but wish to be assisted on the odd occasion, such as going to work without using too much energy. Quicker performance every time – This electric bike can travel up to 15mph when assisted so you can be sure that wherever your next destination is, you are going to get there in quick time. Aluminium foldable frame – The aluminium folding frame is perfect for those that do not have enough room at room, and better yet, it can be put in the boot of the car for you to take on your travels. Whether you are off on holiday or just wanting to travel long distances, being able to fold the bike up and put in the car is a very handy feature. Mudguards – This electric bike comes with mudguards that will help protect your clothing during travel in poor conditions. This is especially handy if you are travelling to work in new clothes, the last thing you want to do is turn up with mud everywhere. Comfy seat – The seat that comes with this electric bike is especially comfy. It was designed to make sure users that travel long distances are perfectly comfy and enjoy their ride, wherever they go. 20” wheels – This electric bike comes fully equipped with 20” wheels to better your riding experience. These tyres are great for those travelling long distances or over rough terrain where the tracks on these tyres will provide them with even more grip. Electric bikes don’t come much better than the Viking Harrier, especially not at the price this bike is sold for. This bike was only released in July 2016 so it’s a new release when compared with other electric bikes in the market, but it hasn’t stopped receiving good reviews since that date. Many people love this electric bike purely because they can ride longer distances than other bikes on the market, and with the ability to take the battery off completely so you get complete freedom makes this bike top of the range. In terms of comfort and overall design, it’s easy to see why this bike is already one of the most popular on the market. It comes with a very comfortable seat and nice easy grip handlebars to keep users in complete control over every ride. If you are looking for a good quality electric bike that isn’t going to deteriorate in quality after every ride, you should definitely consider the Viking Harrier, it has everything you need to enjoy any ride.